Welcome to the final part of our introductory series on Agile Results. In this part, we’re going to look at how to systematically implement all the non-core components of Agile – how to avoid the Productivity Pitfalls that Agile highlights, how to handle Action Lists, Scripts, “Keys” and “Strategies” that don’t really belong anywhere in the day-to-day usage of Agile Results. The implementations you’ll read about below are simply solutions that we have developed here at Asian Efficiency. They are most definitely not the only way to implement the various aspects of Agile, and they may not even be the most efficient way – they are simply the way(s) that we found to be the most convenient in terms of minimal setup time and ability to make things stick. Some concepts of motivation, from both Agile and non-Agile sources. You can copy-paste and print this out as a checklist, to be used for quick reference just before you start working on something, or when you feel stuck as you’re working on something. * Take breaks, via pomodoros. * Clear to neutral when done. Ask: What is the right thing to do right now? * How to perform (process). * Timeframes: past, present, future. * Change hats - get up, create that mode in an empty space and step into it. 4. Change the questions you're asking. 5. Change the metaphor, change the task identity or significance. * Take breaks with pomodoros. * Work in a different location. Power Hours. This refers to the times of day when you are the most productive, regardless of task at hand. You can discover these by noting down daily in your journal when you think they are, and then aggregating that data over a month. Note that they are usually influenced by sleeping, eating and exercise patterns. Mini-Plans. First seen months ago in the super-secret Asian Efficiency Newsletter. Anyone who has used GTD knows that it is sorely lacking in accurate reviews and reflections. Agile makes tracking what you’ve done much easier. Each day, you mark in your Roadmaps and Journal what was done and what was not, and why. This is your review, and your time to reflect. Agile’s startup and shutdown processes are covered by Morning Rituals and Evening Rituals. Thanh was nice enough to put this together for reference. The easiest way we have found to implement this was that as you (or just after you) set your outcomes for the day, run Covey’s Quadrant analysis to segment your outcomes for the day. Start working on your musts first (quadrants 1 and 3), then your shoulds (quadrant 2), then your coulds (quadrant 4). Having a personal wiki allows you to cover a number of different Agile concepts with one application. This is where your reference lists go, and where any static information you want to store should go. We have an article about setting one up here. In terms of our implementation of Agile, it is where your scripts and processes go. Remember that Agile defines scripts as complex routine that are likely to occur again in the future. Solutions to common technical problems, e.g., command line code for how to disable inline attachments in Apple Mail. Contact numbers for your financial institutions. Your personal wiki is also a good place to store your daily reminders (though these could also go in your Daily Journal template). You’ve already seen one part of this in the “How to Work” section, where you put on different hats to tackle a problem. You’ll probably recognize “action lists” as simple lists of tasks. The best place to store them is in a task management application, like OmniFocus or Things. Or, you could go simple and use a text document or MS Word. The way that action lists are processed is via the standard GTD processing formula, which Agile calls Triage. This is where you either do, file, delegate or date for later. Note that your Rule of 3 outcomes sit outside of your task manager. We’ve experimented with different ways to implement the Rule of 3 directly within both OmniFocus and Things, but have yet to come up with a satisfactory way to do it. When we know how to do it properly, there’ll be an article here about it! If you’ve implemented Agile the way we have here at Asian Efficiency, you’ll already have covered a lot of these along the way. What is interesting about these parts of Agile is that they are really unique to each person – each person has a different way of interpreting them, and they effect people in different ways. For example, “friction” is considered bad in Agile, but friction can come from many things – friends, family, roommates, a job, lifestyle, culture etc. The simple fact is, it’s different for every person, so the solution will be different for every person. Our suggestion is to read over the list during your monthly review, and pick the ones that gel with you and implement them as sprints, or over time. Remember that there’s no need to implement all of them right away, and that productivity systems are there to support you, not the other way around. The internal process that we use at Asian Efficiency for implementing non-tangible ideas is to build a small system or set of drills to reinforce those ideas. For example, the “how to work” list that we’ve shared above is our implementation of a number of Agile and non-Agile productivity concepts. What we’ve written about Morning Rituals and Journal Entries are both different ways to implement otherwise-theoretical concepts that we’ve learned from others. So there you have it – Agile Results in a nutshell. Reading through parts 1 to 4 of this series, you’ll have a very clear idea of how Agile Results works, how it can help you, and how to set it up from scratch. If you have any questions, make sure you ask away in the comments – we will definitely reply, and may even write an article about it. This is not the end of Agile Results at Asian Efficiency however – stay tuned for future articles that will examine with more depth different aspects of Agile, or how they mesh together with GTD or popular productivity apps, like OmniFocus. Also, be sure to check out the original Agile Results book. Great posts. I’m looking forward to trying this out as my current model is feeling a little disjointed. One question – do you consider GTD Horizons of Focus in your overall approach beyond the year? So, the 40k (3-5 yr goals) or 50k (mission) levels? I can see it easily tying into the journal aspect of Agile but thought I’d explicitly ask since I didn’t see it anywhere. Thanks for all the hard work to share your process! I just bought the Agile book, and my sprint for this month is to implement the system, or rather make a first iteration. My solution to applying the rule of three within 2Do (my alternative to Omnifocus) is to “star” the items that are my top 3 tasks of the day. I don’t know if this option is available in Omnifocus. By doing this they will always stay on top of my list. If this is possible to do within Omnifocus, it might be a solution to your problem. I’n new to agile so I might not have understood the Rule of Three fully though. Other than putting stars to task you can also rank the tasks by importance, by giving them 0 to 3 “stripes”. I use 0 stripe as the equivalent of placing it in the 4th quadrant, I use 3 stripes as the equivalent of placing it in the 1st quadrant and so forth. This seems to work out for me. Aaron, for the Covey’s Quandrant analysis you mention to “Start working on your musts first (quadrants 1 and 3)”. But after reading your Covey’s Quandrant analysis article shouldn’t it be quadrants 1 and 2 first? 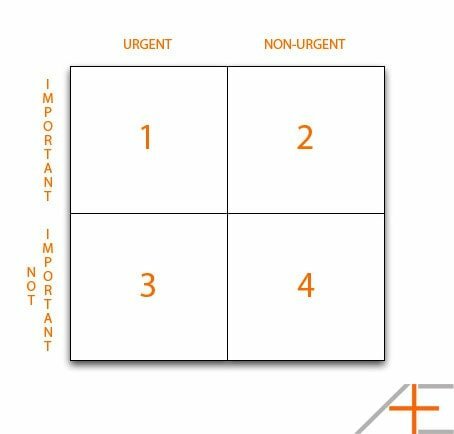 Quadrant 3 is “Not important and Urgent”. Is that a typo or something I’m missing?